Is AI going to steal your job? Two seconds ago we were the biggest, baddest employees at our companies and now this overzealous machine has come along, didn’t even bring a CV, and they’ve already given it the bigger office and a managerial position. This conversation seems like an exaggeration, mixed with a little undue personification, but it feels like an increasingly common one. There are certainly big questions to be asked as AI and Machine Learning become bigger parts of the business world, and it is increasingly necessary to have a reasonable framework for how this discussion takes place. Not only in defining its terms but in understanding how we, the people who will interact with this immense technology on a day to day basis, will learn to cooperate and adapt to its capabilities. On face value this seems like a quite ominous statistic. However, the same study also showed that 45% of senior executives believe their employees will soon be comfortable working with robots, and 79% of them believe that they will too. So where is all of this fear coming from? It’s hard to even pinpoint specific sources on the surface but it feels like over the past decade we have been inundated with messages telling us to fear for our professional existence. I think that the first point in dispelling these anxieties is to recognize that AI and Machine Learning, at least in the form it exists today, are not the frightening all intelligent robo-computers that a lot of people associate them with. Instead they are the result of magnificent human engineering, that sees us stretching technology to it’s limits to contextualise and extrapolate deeper meanings from vast streams of data. A great example is in the world of Marketing. Any marketer worth their salt is passionate about making the most of the data in front of them, and in understanding trends that are previously unseen by others, in order to provide customers with a service unparalleled by any other competition. Surely then, the prospect of being able to work in tandem with machines that can do such a thing should be tremendously exciting? Only a quarter of employees think that their organizations are adequately equipping them with the necessary skills to capitalize on advancements in AI. This statistic is quite telling. It is extremely difficult to become comfortable with a novel technology if we aren’t being adequately educated in it’s function, and how we ourselves can cooperate and make the most out of it. 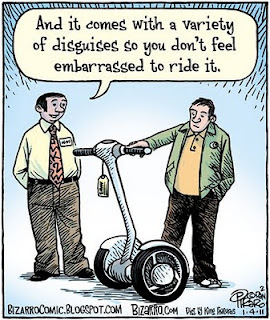 It’s all very well telling me that the segway will revolutionize the world of transport, but if I can’t imagine myself riding one it’s going to be very difficult to get me on one of those things. In the case of AI and Machine Learning it seems a tremendous shame to not get on it and take advantage of the immense opportunities that it represents. Perhaps then what is required is to make people comfortable, both in the business sphere and from an earlier age. The job market is constantly changing and technology is already making its mark, whether it’s tremendous machines on the factory floor, to shrill computers at Tesco’s that let you know an item is not in the bagging area, we have seen daily incorporations of technological advancements that are shaping the way that we conduct the most ordinary of transactions. It is a difficult subject, not least because the future is not set in stone, and whilst everyone can have predictions it is difficult to be completely certain about where this is all going. That being said, it seems that at least for now we need to start getting comfortable with this technology. From a purely professional standpoint it should also be noted that there is a major skills gap growing within sectors. Only 38% of executives say that their organization offer skills training to better prepare their employees for future technological disruptions. Perhaps this is where the real fear is, not of what these machines can do, but in our relative feelings of not being able to keep up with them. Education is empowerment. Yes, there are going to be magnificent things that machines will accomplish, but humans can also learn, we’ve been known to do it in the past. The difference is that now we are armed with both history, technological knowhow, a number of resources designed to help us make this most of these exciting advancements. If we can combine these knowledges then perhaps we can better equip ourselves to take advantage of the changing tides.